Mobile gaming has come quite a long ways in the past ten years, and several titles have gained the complexity and layering that’s usually saved for console and PC games. If you’re a regular Appamatix reader, you may already have seen several of our articles aimed to help users bring their mobile experience to a larger screen, and today, we’re going to show you how to download and play Clash of Clans on your Windows PC, whether you’re playing on version 7, 8, or 10. If you’re an avid CoC player, there’s a good chance that your well-trained eyes will welcome some extra screen real-estate during the action, so continue on to see how we accomplish this easy trick! Clash of Clans has enjoyed a prominent road to success during the time that it’s been around, and even though competitors have come and gone, it continues to remain a popular game that’s played by millions of mobile device owners. This isn’t by luck or gimmick; Clash of Clans is a particularly good strategy game that rewards the time that you put into it (and for some gamers, the money that they put into its paid-items business model.) No matter what level of gamer you are, there’s a good chance that there’s something in it for you to enjoy. Veterans of the real-time-strategy (RTS) genre of games will recognize many of the tricks that the game employs right off the bat, and for people who don’t often indulge in tactical titles, it’s a good jumping off point for fresh interests. This is because Clash of Clans keeps things simple on the surface–it’s about resource management, balancing your efforts between several different tasks at once, and most of all, learning how to study your opponent’s tactics in order to triumph over them. All of these elements are remarkably familiar, tracing back to games as old as chess. The benefit that draws most gamers in, though? The fact that Clash of Clans is free to download and free to play. So too will it be when we download it on your Windows PC, where you can enjoy all that Clash has to offer in high-resolution glory. It won’t be quite as simple as downloading the game on your Android or iOS device–where it’s meant to run natively–but it’s going to come awfully close. A few things, first: you’re very likely going to have to install a bit of software on your computer if you want to play Clash of Clans reliably, but if you follow our guide, you’ll see that it’s safe. Emulation software can often be rife with malware and other bug-ridden software, but Android emulation, which is what we’ll use for mobile gaming on the PC, is perfectly safe. Without further ado, let’s delve into the process! The fact that Android emulation is considered the “standard” method makes it better for consumers, too. It’s left us with a wide variety of emulation software to choose from, each boasting different aesthetic and features from the others. Another example of a competitive market leading to our benefit, right? Though a Google search is likely to turn up quite a variety of emulation choices, we’ve narrowed down your choices considerably in the following list. Each of the below recommendations will run just as well on your Windows PC as it will on your Mac, and on top of that, each of them boasts a professional quality of development that will show from the moment you download them. Bluestacks is probably the first word that will show up when you put “Android emulation” into a search query, and there’s a good reason for it. This emulator is marketed so well that it’s often mistaken as having come straight from Google. Though this isn’t the case, it’s nonetheless a top-notch emulator that will certainly play Clash of Clans, along with everything else you throw at it. 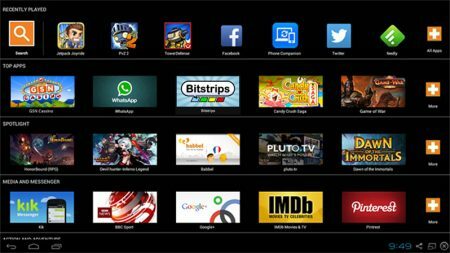 You will have to deal with some third-party software advertising after installing Bluestacks, but if this ever grows to be too much of a nuisance, you can remove it by upgrading to the emulator’s “premium” version that carries a slim monthly subscription cost. Next up is Andyroid, which remains my personal emulator of choice. It’s streamlined, user-friendly, and more minimalistic than the marketing-heavy emulators like Bluestacks. On top of that, it boasts all of the features that you’d want from emulation software. If you truly want to bring the mobile experience to the big screen, you can use Andy to tether your smartphone or tablet to your computer, using the mobile device’s touch screen as an actual controller for the apps that you’re emulating. Droid4X isn’t as frequently used (or as widely known) as many other emulators, but it remains a good choice for those looking for strong software in a free package. Once again, this emulator is particularly good for gamers; it offers an installable software package as well as a downloadable “controller” app that can do just as described above–turn your mobile device into a handheld controller for your gaming. This includes Clash of Clans, in case you were curious. Manymo is always my final recommendation, but not because it’s a lesser emulator. It’s an impressive little piece of software that actually requires no installation on your computer–instead, it runs in your web browser. You can emulate using different releases of the Android OS at varying resolutions popular with many different types of Android devices, which can be convenient for certain apps. The free version will only afford you 10 limited-duration uses per month, but a $9.99 monthly subscription fee will extend that usage quite a lot! Manymo remains a great choice for those who aren’t in a position to install extra software on their computer. So, you’ve found the right emulator, you’ve downloaded it, installed it, (or, in Manymo’s case, you’re hanging out in your browser.) What next? Surprisingly, the rest of the steps you’ll follow to get Clash of Clans up and running on your PC are just the same as you’d use when installing it on an actual Android device. Once you boot up your new emulator, you’ll probably notice that the “Home” screen looks remarkably similar to that of a mobile device. Since this is a legit version of Android and we’ll be downloading an equally legit version of Clash of Clans, you can treat it just like one, too. Tap on the Google Play app store and search for “Clash of Clans.” Simply find the app, download it, allow it to install, and you’ll be in business! All that’s left for you to do is start making your way through those introductory levels and learning the ropes of the game. Or, if you’re an old vet, jump into the deep end! Note: If you’re a Manymo user, you’ll perform this final step a little bit differently. You’ll need the .apk (application) file for Clash of Clans to upload it into the browser-based emulator, but this should be simple to find online. If you’re looking to step up your game as soon as you start playing, you’ll be pleased to know that Appamatix has covered Clash of Clans extensively, in the past. Take a peek at some of our previous articles on the topic, and learn new tips and tricks about resource management, playstyles, and different tactics that you can use in any scenario to give yourself an upper hand in the game’s many challenges–whether that be overcoming your opponents on the battlefield or joining your friends in a Clan. Hopefully, the above guide will help you to have Clash of Clans up and running on your computer in no time at all. Emulation is a simple process that’s becoming more and more common as users choose to bring both their gaming and their messaging to a larger screen. Since you’re running an actual instance of the Android OS when doing so, there’s little drawback to this practice, and the benefits it can give to your well-spent hours in Clash of Clans are a testament to this. No more cramped screens, accidental taps, or losses that result from trying to find and watch your enemy across only several inches of viewing space. 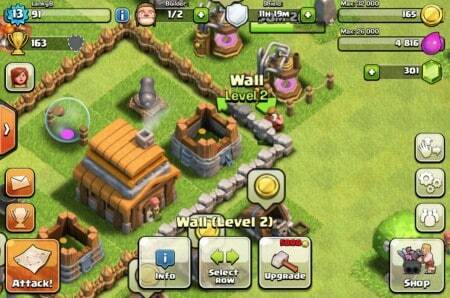 Whether you’re on Windows 7, 8, or 10 PC, or even Mac, Android emulation makes your Clash of Clans experience a breeze. If you’re someone that regularly looks for PC downloads for their favorite Android games, let us know what you thought of the guide in the comments below!